Meals at home must involve the least bit of preparation, washing and yet still be nutritious. Not easy arh!! I came across a picture of this in pininterest. I made a few minor adjustments to reduce processed food and minimize dish washing. The pininterest recipe called for bacon (which has a high salt content but undeniably yummy!) which I replaced with salmon and it was baked. I did everything in the air fryer so that I only needed to wash the one and only baking tray. I chopped up a huge piece of salmon. Air fried it for 15 mins at 160°C in the baking tray, stirring it once in a while. The pieces were merrily cooking in salmon oil. 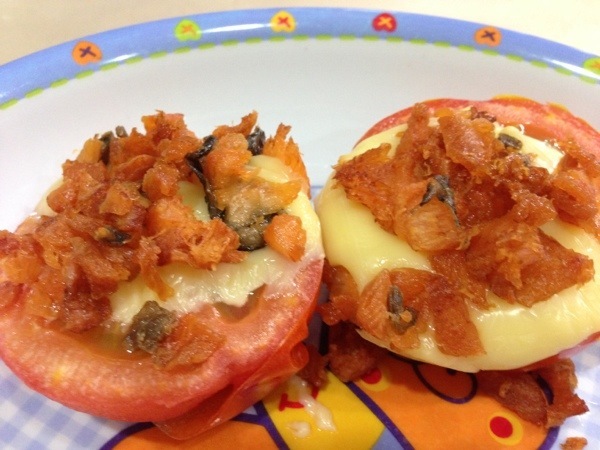 Once the pieces were crisp, I chopped up a large tomato into 2 and top them off with cheese then put the salmon pieces on top of them. Still using the same tray, I air fried them for 10 mins at 140°C. 宝贝 walked herself home after alighting from the school bus at the pick up point. She appeared at the door just as the food was done. As usual, it’s condiment free. Served with a slice of pumpkin bread we made together yesterday and finished off with a banana. The air fryer is really the most idiot proof appliance around. You won’t burn the house down, you probably just end up with charred food. And with no oil involved! Well, it’s a breeze to make this. 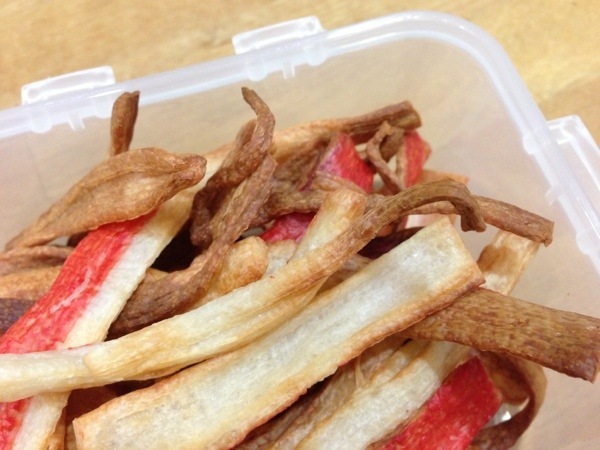 I didn’t use up the whole packet of crabsticks because 小小宝贝 was wailing halfway through my food making. The only chore is to peel the plastic off the crabsticks and to “unravel” them. I used 160°C and fried them for 15 mins. I turned up the heat to 180°C for the last 5 mins. Every 5 mins you have to stir them and separate them from sticking to the tray and to one another. I didn’t manage to do that as I was changing diapers, so the top few were a little chow dar. And some underneath were still whitish and not very crispy. An attempt to “dewhiten”, I just coined the word, one of my many white elephants in the kitchen. This is an idiot proof (I’ve proven it! Even I can do it!) recipe. No oil involved, natural food, totally yummy!! Just slice your apple thinly (you don’t even need to core it) if you are skillful and patient with the knife. I’m not equipped with the skill nor the temperament, so I chose to do it with the shredder. I ended up with various shredded sizes, thickness of apple slices. But I’m chin chai lar. So I find it ok. Spread them out on the wire mesh of the air fryer. Set the temperature at 160°C for 15 mins. Just stir them every 5 mins to keep them from sticking together. Voilà! Apple crisps! Mine don’t score too high on the looks department but they are yummy!! Don’t judge my apple crisps by their looks!!! The small slices are crunchy n sweet. The bigger slices have crunchy edges and sponges middles. Thumbs up from my 宝贝! They are easy to prepare and definitely healthy! Not only that, economical too! 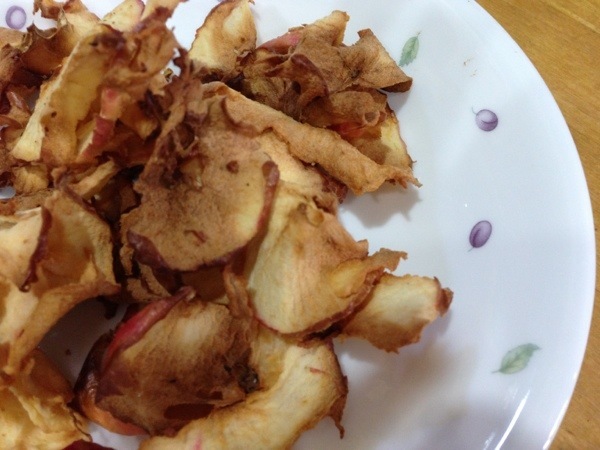 You don’t have to pay the exorbitant price for apple crisps from the supermarkets. 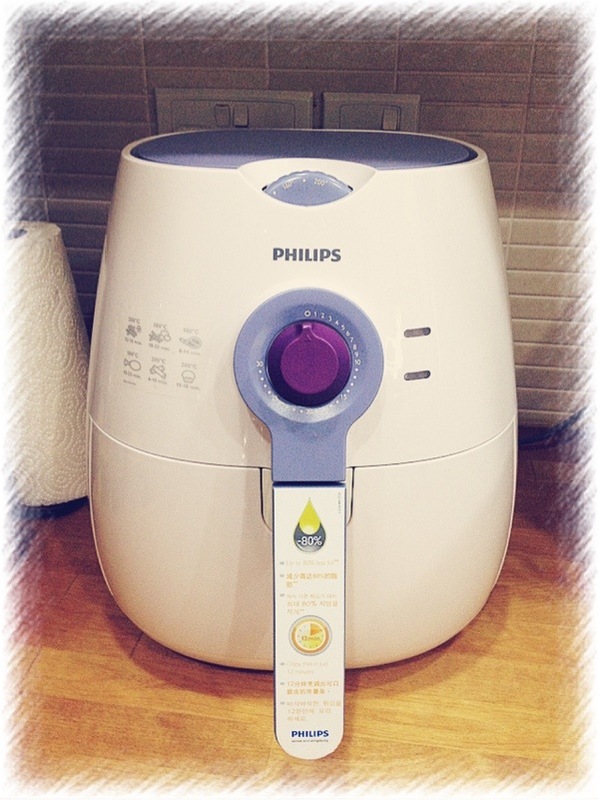 I’ve been reading about people gushing about their air fryers for a while. It was some time before I convinced myself to buy it, because of its hefty price tag!! Anyway, I’ve bought it. I’ve only used it to fry some fish fingers and it’s true I didn’t use a drop of oil. They turned out crispy. But then again I wasn’t a fan of fish fingers. I cut up some potatoes into strips and made my first batch of home made fries. I soaked them in water for 30 mins to get rid of the starch, brushed a little oil on them and air fried them. They turned out quite fine, though nowhere near the legendary Macs fries. Macs fries are really unbeatable and absolutely sinful, unfortunately. Then the air fryer just sat there, under utilized, until I checked out the recipe book and googled some recipes online. 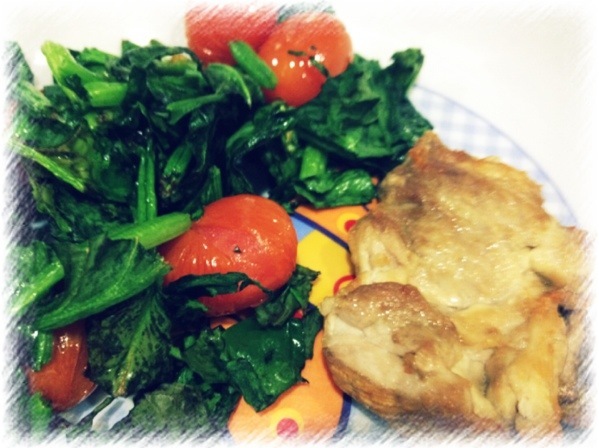 I decided to air fry some food for 宝贝’s lunch. As usual, no condiment meal. I put a piece of chicken thigh into the mesh basket. You can marinate it with the condiments of your choice 2-3 hours before frying or even the night before. Brush it with a layer of oil. I forgot to brush mine so it came out a little dry. Set the temperature at 180 degrees Celsius for 15 mins. If you use a traditional oven it’d take abort 30 mins. I roasted some cherry tomatoes and some cut up spinach for 6 mins at 160 degrees Celsius. The chicken turned out a trifle too dry. I must try again by brushing it with a little oil. The tomatoes came out great. Nicely roasted. The spinach was a surprise. They became crunchy, like those dried seaweed that I love to snack on. The next time I fry the spinach, I should mix it with a wee bit of salt and maybe some spices. It will make a good healthy snack, for myself of course.